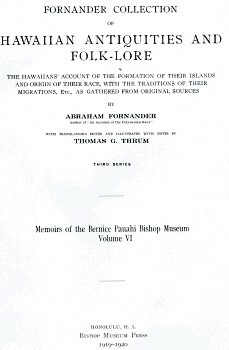 Abraham Fornander : Hawaiian Antiquities, 1919. Volume VI, Third Series, Part 1, page 206. Page 206 BATHING BY JUMPING. The acme of skill in leaping into the water, with Hawaiians, regardless of height, was to enter the water feet first, with the least agitation of the water. The Tahitians' enjoyment of the sport was the reverse, for they delight to create the greatest splash, to accomplish which they double their feet under them in jumping from a height, so as to plump into the water with the greatest possible commotion. Diving headfirst into the water is seldom if ever practiced by either race. A long board is hewn from the willwilli wood (34), four fathoms long, some three, so on down to one fathom; the width is one yard. The board is alaia, (35) three yards long. The surf is kakala, a curling wave, terrible, death-dealing. The board is olo, (36) six yards long. The surf is opuu, (37) a non-breaking wave, something like calmness. When the surf rises and breaks lay the board on. The man has two places to slide in the surf, the foam, which is within the curl, or the end, which is outside the curl. While wiliwili may be the preferred wood for surf boards, on account of its lightness, koa and breadfruit boards are also in common use. Alaia is the name given to a small, thin, surf board. Olo was the large, thick, wiliwili surf board. Opuu, the blind-breaker character of surf prevalent during calm periods. Surf riding has a wider range of sport than shown above, for canoe surfing is also very generally practiced, and occasionally body surfing. This requires strong, expert swimmers to attain sufficient momentum to ride in on the surf without a board or other support. This, termed kaha nalu, is still practiced. Page 207 (Hawaiian Text) KA LELE KA W A. He pali kiekie ia, kahi e lele ai ke kanaka. Ina opu ka lele ana o ke kanaka a ku ka nuku o mua, alaila, "he iomo ia." Ke ano o ia hua olelo, aohe pane kai. ... KA HEENALU. He papa loihi ia i kalai ia, "he wiliwili ka laau." Eha anana ka loa, ekolu kekahi, pel a a hiki i ke anana hookahi, he iwilei ka laula. Eia na inoa o na papa a me ka nalu. He alaia ka papa (ekolu iwilei ka loa). He kakala ka nalu - he nalu poi, he aaka, he make. He olo ka papa (eono iwilei ka loa). He opuu ka nalu, he nalu poi ole, he alaneo ke ana. Ina aohe nalu, alaila, kahea aku i kai, penei e hea ai. I ke ku ana o ka nalu a hai, alaila, hoomoe ka papa, elua wahi a ke kanaka e halo ai i ka nalu. 0 ka hua maloko ia o ka nalu, o ka lala mawaho ia o ka nalu. Geoff Cater (2010) : Abraham Fornander : Hawaiian Antiquities, 1919.